The NRL research team. 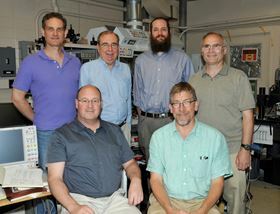 Back row (left to right): research physicists Aubrey Hanbicki, Paul Campbell, Adam Friedman and Jim Culbertson. Seated front (left to right): Glenn Jernigan, research chemist, and Keith Perkins, electronics research engineer. Photo: US Naval Research Laboratory/Gayle Fullerton. An interdisciplinary team of scientists at the US Naval Research Laboratory (NRL) has demonstrated that monolayer 2D transition metal dichalcogenides (TMDs) – atomically thin semiconductors – undergo a phase change from semiconductor to metallic when exposed to airborne chemical vapors. As they report in a paper in Scientific Reports, the scientists recorded optical and electronic evidence of the phase transition, which could be used to create an entirely new class of chemical vapor sensors. This new class of instruments is potentially more sensitive than current state-of-the-art devices, and could be selective for specific nerve agents and explosive compounds that are of great concern on today's battlefields. Since the discovery in 2004 that single monolayer layers of TMDs can be isolated from bulk materials due to the weak bonding between the layers, known as van der Waals bonding, TMDs continue to reveal new and remarkable behaviors and properties. "These materials are extremely promising for chemical vapor sensing applications because the inherent few-atom-thickness of the material greatly enhances their sensitivity to even the smallest surface disturbance," said Adam Friedman, research physicist in the Material Science and Technology Division at NRL. "Apart from the immediate interest to basic research, as this particular method of creating of phase transition in TMDs has never been observed or explored before, it has great potential application in a new type of phase-based, multifunctional chemical vapor sensor." Monolayer TMDs offer possible advances in technology over conventional materials, potentially paving the way for inexpensive, flexible, high-performance devices that exploit their unique surface-dominated functionality. Chemically abbreviated as MX2, where M is a transition metal and X is a chalocogen, monolayer TMDs include insulators, semiconductors, metals and other types of materials, and possess a variety of properties not observed in their bulk material equivalents. Certain TMDs respond selectively, via a charge transfer process, to a class of analytes that includes nerve agents like venomous agent X (VX). A microscopic quantity of analyte landing on the surface of the TMD acts as an electron donor and local reducing agent, measurably affecting the conductance of the film. The NRL team hypothesized that certain strong electron donor chemical analytes, including certain nerve agents and explosives, could provide enough charge transfer to the TMD to achieve a phase change. To test their hypothesis, the researchers exposed monolayer TMD films to strong electron donor chemical vapor analytes, and monitored the films for their conductance and optical response. They found that the conductance response of their devices ceased after moderate exposure while the overall magnitude of the conductance abruptly increased, signaling a phase change. The optical response confirmed the occurrence of a phase change. "We assembled an exceptionally large data set that included multiple methods of measuring these types of films and concluded that the behavior that we observed is not due to doping and is most likely due to partial, localized phase changes in the areas of the TMD film where weakly adsorbed analyte transfers charge to the lattice," explained Friedman. This newly discovered behavior opens up the possibility of an entirely new approach to low-power, flexible, versatile chemical vapor sensor devices; harnessing the phase transition for the direct detection of strong electron donor analytes will create an entirely new chemical vapor-sensing model. It will allow passive-type optical measurements to be combined with, or used separately from, active conductance measurements to identify analyte vapors on a single device. Previous studies of similar diffusion-less phase changes have shown speeds in the nanosecond range, and the envisioned devices will also be fast, exceeding the state-of-the art in detection speed. Because the amount of charge necessary to induce a phase change in each TMD material is different, a suite of simultaneously sensing TMD materials will allow various strength electron donors/acceptors to be detected and even identified with the necessary redundancy to minimize error. Due to their low space requirements and expense, these sensors can also easily be combined with current sensors to create an even more versatile instrument for current US Department of Defense platforms.